Please enter first names and date for Guestbook. Make your perfect day complete with this wedding guest book alternative. 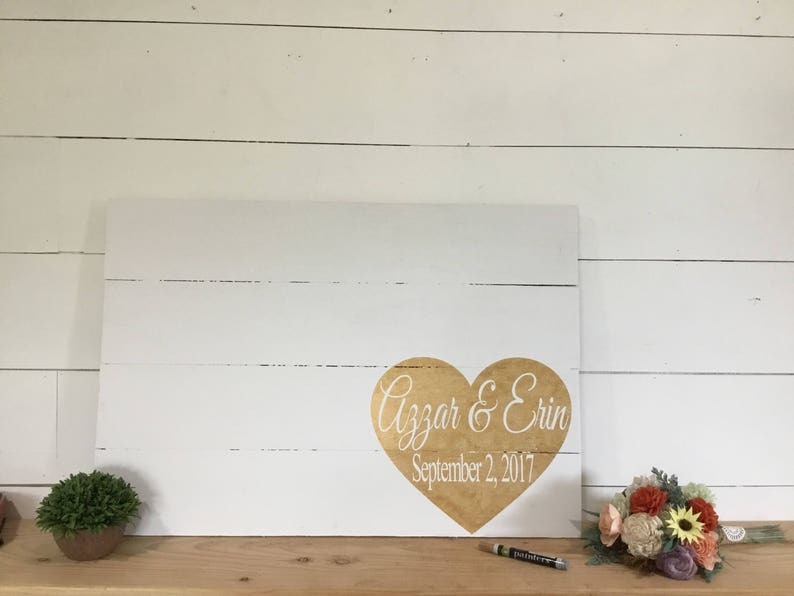 This rustic guest book trend is taking over the wedding scene! Our personalized wedding sign is a sentimental way to remember the special people that will share in your day. 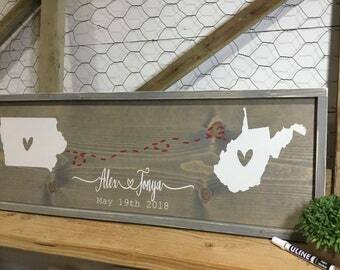 ♥ The wood is distressed then left unsealed so guests can sign with INCLUDED GOLD/SILVER SHARPIE PEN. PLEASE ADD YOUR CUSTOM NAMES AND DATE IN NOTES TO SELLER AT CHECKOUT. I hand pick each piece of wood for your new wedding decor with care. sign is hand cut, sanded and hand painted. No two hand painted signs are exactly the same; you will receive a sign very similar to the pictures. Sometimes the wood will have knots or splits ... this should be considered as part of the charm of your new wall hanging and not a defect. I love how our sign came out! Cant wait to use it for my wedding at the end of October of 2018! I did not receive the paint pen that was promised instead a gold sharpie was sent. I was a bit disappointed about that since in the description mentions " INCLUDED PAINT PEN". Overall the sign is great! It is perfect for our wedding! This sign was absolutely PERFECT! Durable, looks just like the picture and is a large decorative piece! We had about 250-300 guests at our wedding and their signatures filled up the entire thing! We can't wait to hang it up for people to admire!